FULTON – Children living in the City of Fulton may receive upwards of 60 free books by the time they reach age five, thanks to the expansion of Dolly Parton’s Imagination Library. Strongly supported by the Fulton City School District, Doll Parton’s Imagination Library perfectly coincides with the district’s Strategic Coherence Plan, which aims to have 95 percent of third grade students read at, or above, grade level by 2024. Dolly Parton’s Imagination Library roll out for the Fulton City School District was recently celebrated at the district’s 5th annual Parent University event, where FCSD Director of Literacy and UPK Heather Witter, left, and Superintendent Brian Pulvino, second from right, were joined by Literacy Coalition of Oswego County President Mike Egan, far right. Enrollment for Fulton children has already begun, with a recent push during FCSD’s recent Parent University event. There, Heather Witter, FCSD Director of Literacy and UPK, said she was thrilled with the community’s interest in early literacy. 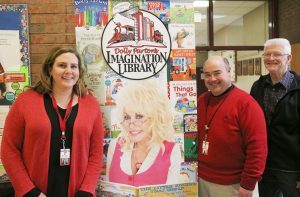 Dolly Parton’s Imagination Library expansion into the greater Fulton community comes at the heels of the recent Hannibal Central School District introduction, to which both the Sandy Creek Central School District and Altmar-Parish-Williamstown Central School District followed. Together, with the help this free program, local families can help eliminate the reasons parents do not read to their child. Once enrolled, children will have a free, age-appropriate book shipped to their home monthly until the age out at five years old. Fulton City School District UPK students are eligible to enroll in the program, as well as any children under the age of five whose families reside within the school district boundaries. To enroll, parents or guardians should submit an official registration form, available both on the FCSD website and local libraries. Forms must be approved and on file with the Untied Way of Greater Oswego County, which has made the effort possible with the Literacy Coalition of Oswego County and the Alliance for Economic Inclusion. Fulton City School District Superintendent Brian Pulvino said he is beyond thrilled to have Dolly Parton’s Imagination Library available for future FCSD students and those who will enroll, or are enrolled, in the district’s UPK program.